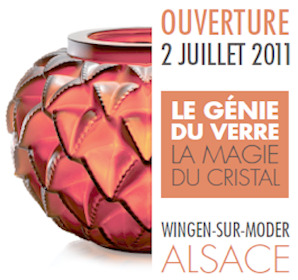 The Lalique Museum will open its doors on the 2nd July 2011 in Wingen-sur-Moder, Alsace. Unique to Europe, this new museum, a qualified Musée de France, offers more than 600 pieces exhibited over 900m² in a setting thought up by Ducks Sceno. Built by the internationally renowned architect, Jean-Michel Wilmott, on a former glass-blowing site, active from the 18th to the 19th century, the museum will emphasize the multiple facets of René’ Lalique’s work, from jewellery to architectural elements and even perfume bottles and decorative arts heavily inspired by the woman and fauna and flora.